A president’s power to pardon is vested in Article 2, Section 2 of the Constitution, which says “he shall have Power to Grant Reprieves and Pardons for Offenses against the United States, except in Cases of Impeachment.” So he can pardon anyone, even conceivably himself. It’s a power that cannot be taken away or even limited, and there’s no way to take a pardon back once it's granted. But if there aren’t any legal limits, are there moral ones? The time for a national conversation on such issues is before pardons are issued, not after. Q. Are there any pardons that would be out of line for the president to grant? What about blanket pardons or amnesty covering anyone in his administration? Bush could conceivably say something to the effect that anyone involved in the creation or implementation of the CIA's interrogation program, or the Defense Department's treatment of detainees, “is hereby pardoned from any criminal charges that might be brought against him or her for their participation” etc. But wouldn’t such a pardon – so clearly intended to stymie future investigations and accountability – be an insupportable affront to the rule of law? Q. 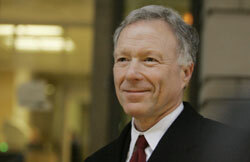 Would a full pardon for Scooter Libby be blatantly hypocritical and self-serving? In my July 3, 2007, washingtonpost.com column, I called Bush’s commutation of Libby’s sentence “Obstruction of Justice, Continued.” And U.S. District Court Reggie B. Walton recently pointed out that his sentence for Libby was at the low end of the federal guidelines and that Bush’s decision to commute the sentence fed some people's notion that justice isn't equal. A pardon would only exacerbate both of these critiques. Establishing some sort of consensus on what sorts of pardons would irretrievably tarnish Bush’s (admittedly already badly stained) legacy might at least give him pause. The most significant and powerful way in which Bush’s legacy will outlive his presidency, of course, is through his Supreme Court nominations. Justice Samuel Alito and Chief Justice John Roberts have noticeably tilted the court, hugely increasing for years to come the likelihood of decisions sympathetic to the Bush worldview on such issues as civil rights and voting rights, executive power, abortion, capital punishment, affirmative action, and the like. Bush appointees have had a significant effect at the appeals court and district court level as well. But there are many appointments currently stalled on Capitol Hill by Democrats who are hoping for a Democratic president. Q. Will Bush make one last attempt to install conservatives in key judicial positions? Gerald F. Seib recently reported in the Wall Street Journal that social conservatives such as J.C. Willke, president of the antiabortion Life Issues Institute and former head of the National Right to Life Committee, consider it a top priority for Bush to compel the Senate to vote on the federal judges he has nominated: “Mr. Bush ought to instruct Republicans in the Senate 'simply to close up shop until this constitutionally correct set of people is given a shot at a vote,' Dr. Willke said. 'And he's done nothing.'" You've forgotten that for legal purposes corporations are treated as citizens. The telecoms will get a pardon for illegal wire taps. Blackwater will be pardoned for slaughtering countless Iraqis and tax evasion. Halliburton, Bechtel, Flour, Dyncorp and hundreds maybe thousands of war profiteers will be pardoned for systematic fraud and abuse.